We live in times of zero trust, a term stemming from computer security research, which is applied to all sectors and businesses. Most prominently zero trust is used in cryptoeconomic systems such as Bitcoin and other blockchain-based technologies – describing the practice to “never trust, always verify”. But what is cryptoeconomics exactly, and what are we talking about when we are talking about “Future Cryptoeconomics”? We are facing a discipline which is not formally defined yet. It reminds us of the early developments of game theory, an area of study that at the beginning was very narrowly defined, but then grew to be an interdisciplinary field that included the social sciences, political sciences, and many other disciplines. In order to discuss the future developments of world computers, immutable code and cryptocurrency, we must broaden our viewpoints and make sure to understand the full scope of possibilities of true decentralisation. “Forking institutions” might be a starting point, but we have to be aware that this possibly also means a “constant destruction and recreation of institutions and experimental cultures”, to make space for invention and new disruptions. Future Cryptoeconomics are debated and tested in almost real-time, and we have a long way to go in order to achieve ‘cryptoeconomic literacy’ and global adoption of cryptocurrency. Could anxiety foster mass adoption of cryptocurrencies? The transparency vs. privacy debate, or the shortcomings of fiat, banks and large financial institutions? Future Cryptoeconomics seeks not to find answers to speculations, but to identify the questions that are foundational for envisioning next societies. 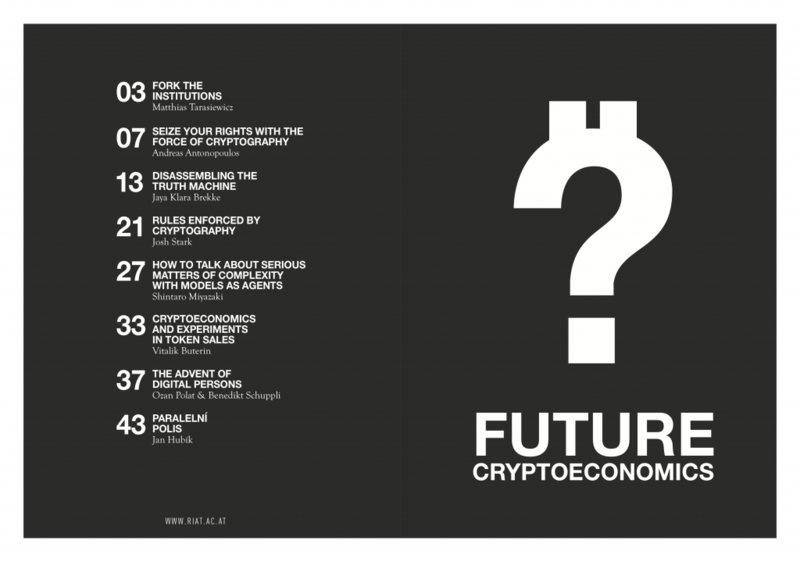 Future Cryptoeconomics is a publication by RIAT, featuring essays and interviews from the scope of interdisciplinary cryptoeconomics.